The LMS Traditional Catholic Calendar 2011 is now on sale. Please email me if you would like one; it costs £7. The calendar shows the rich variety of events going on around the country, with Pontifical Mass in a Gothic Abbey Church and a thoroughly modern Parish Church; St Charles Borromeo in Stoke and Westminster Cathedral; Mass in a historic private chapel during a pilgrimage, a procession, a baptism and the Blessing of Throats on the Feast of St Blaise – a good few other things as well, including events of both the Fraternity of St Peter and the Institute of Christ the King Sovereign Priest. It includes information about the LMS and related events coming up in 2011. It has all the national feast and fast days of the 1962 Calendar, is sturdy and well printed. Numbers are finite and we ran out last year, so get yours now! The Sodality of the Five Holy Wounds of Our Lord Jesus Christ takes as its model the traditional sodalities that were once quite common in the Catholic Church. It was founded in 2010 by a group of lay faithful in the Archdiocese of Southwark. Fr Timothy Finigan, Parish Priest of Our Lady of the Rosary, Blackfen, is Spiritual Director. The group is characterised by devotion to the Five Holy Wounds and by attachment to the traditional liturgy of the Roman Rite. We meet together under the provisions of the Code of Canon Law (1983): ‘Since, like all the Christian faithful, lay persons are designated by God for the apostolate through baptism and confirmation, they are bound by the general obligation and possess the right as individuals, or joined in associations, to work so that the divine message of salvation is made known and accepted by all persons everywhere in the world’ (Canon 225 §1). Meetings usually take place once a month, consisting of prayers, an allocution and a discussion. Members have two commitments – to pray the Prayer before a Crucifix (En Ego) daily, and to attend the meetings where possible. Two feasts are observed – the Friday after the Third Sunday in Lent (Feast of the Five Holy Wounds) and 14 September (Exaltation of the Holy Cross). 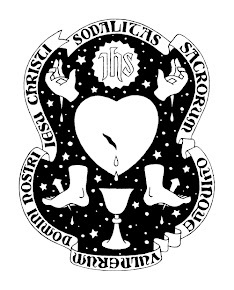 If you are interested in joining the Sodality please attend one of our meetings or email fiveholywounds AT gmail.com. En ego, o bone et dulcissime Iesu, ante conspectum tuum genibus me provolvo, ac maximo animi ardore te oro atque obtestor, ut meum in cor vividos fidei, spei et caritatis sensus, atque veram peccatorum meorum paenitentiam, eaque emendandi firmissimam voluntatem velis imprimere; dum magno animi affectu et dolore tua quinque vulnera mecum ipse considero ac mente contemplor, illud prae oculis habens, quod iam in ore ponebat tuo David propheta de te, o bone Iesu: Foderunt manus meas et pedes meos: dinumeraverunt omnia ossa mea. A plenary indulgence is granted on each Friday of Lent and Passiontide to the faithful, who after Communion piously recite the above prayer before an image of Christ crucified.